Just one week until the start of the National Gathering. The excitement is building around here as we put the final details in place. I looked at the attendee list and found my enthusiasm rising to eve greater heights. This is going to be a fantastic event. Hope to see you there. Last summer I interview Ben Hamilton-Baillie for one of my favorite podcasts of all time. The topic was shared space and, if you haven’t heard it, it is definitely worth a listen. This week I found out, through Ben’s Facebook feed, that his father is a World War II veteran who lead numerous escape attempts from German prison camps. The stories are amazing – at one point he had made his way to within feet of the Swiss border before being apprehended – so, if you want to be inspired by an amazing person, take a moment today and read his obituary from 2003. Would love to have met this guy. This was Hamilton-Baillie's fifth escape attempt; he was responsible for the design and construction of the tunnel, the most complicated attempted so far. It started under a trap-door in the floor of a lavatory, and was provided with props, lighting and a forced air-supply. During its construction Hamilton-Baillie was constantly at the work-face, inching towards the perimeter wire in extreme heat and discomfort. On the night of the break-out everything went perfectly, and Hamilton-Baillie and Captain Frank Weldon RHA, the escape commander, broke out into the fresh air beyond the German wire. I also want to say thank you to one of our best friends in Vancouver, Gordon Price, who took a NY Times article on how infrastructure in L.A. is falling apart and mashed it up with clips from our Growth Ponzi Scheme series. Gordon gave us the premiere tour of Vancouver when we were there. He is a brilliant guy who is seeing past the dollars and cents debate to the heart of the problem. Unfortunately, they’re still missing Marohn’s point: it’s not failing to make the investment; it’s failing to build the right kind of community that can pay its way in the long run – maintenance costs included. We’re going to talk a lot about debt today so I thought we should pause and acknowledge that foreign ownership of U.S. debt has now passed $6 trillion. That is five times the raw amount it was a decade ago. Now I’m not against foreign debt – a little bit might even be healthy – but since I’m concerned about how we are using our debt in aggregate, the ownership of that debt also becomes an issue. The Keynesian apologists among us – as well as the Cheney-deficit apologists – have offered comfort with the (silly) notion that, since we owed our debt primarily to ourselves, we could just not pay it back and it wouldn’t really matter. It was like dad owing mom, in a sense (a warped sense of what money is – a communal good – instead of what it really is – a store of value and a proxy for your labor). Well, foreign ownership changes that. Yes, we can print as much money as we want and pay them back with devalued dollars (our present policy), but the more we do that, the more our economic clout erodes. We’re literally playing with our dominant competitive advantage – our position as the world’s reserve currency – because our home economy is too dysfunctional to fix without enduring pain we desperately want to avoid. For some context, if interest rates ever return to non-manipulated, market values (they may not, sans a collapse of the currency), a 5% rate on a 90-day treasury bill would make the annual interest on $6 trillion rise by $300 billion. For comparison, the “devastating” sequester cuts of 2013 were $85 billion. And 5% represents good times. If we are forced to go higher, party over. The trial over Detroit’s bankruptcy began this week. Detroit had $18 billion in long term debt when it filed for bankruptcy. In settlements, they’ve been able to stiff most of their bondholders as well as shortchange their pensioners – isn’t debt grand – but a few stubborn creditors have held out, insisting there is more wealth there and that Detroit should be forced to pawn the family jewels. In the trial starting Tuesday, Syncora maintains that the COPs holders should get much more than 10 cents on the dollar. In an audacious move that’s been portrayed as heartless, Syncora insists that the city raise more money for creditors by selling off the Detroit Institute of Arts, which the city owns. The city, however, plans to put the institute beyond the reach of institutional creditors through a novel arrangement called the Grand Bargain, through which the art museum would be transferred to an independent trust and not a penny would go to the COPs holders. Syncora has protested in its pretrial brief and other filings that the Grand Bargain is a fraudulent conveyance that violates due process. It also argues that the art collection could fetch much more money on the open market, at least $8 billion. Debt is an integral part of the second phase of the growth Ponzi scheme. Phase one is rapid growth, phase two is stagnation – hanging on, largely with debt – and phase three is then decline. Texas likes to tout their “economic miracle” – high growth, great services and amenities, low taxes – but, when we scratch the surface as the Texas Tribune has done, we find that it’s really no miracle, just debt. Texas circa 2014 is simply California circa 1984. The trajectory is the same, Texas just got started later. Over the last decade, local government debt has grown around the country, but Texas, with an economic performance in recent years that has outpaced the rest of the country, is a special case. Of the 10 largest states, Texas has the second-highest local debt per capita as cities and school districts have gone on a borrowing spree to maintain or expand amenities while not raising taxes. I found this little article from here in Minnesota to be illustrative. So why did the city have their credit rating downgraded? Oh yeah, I guess that makes sense. Yeah, that makes sense, but ask yourself if the next paragraph does. Hint: it doesn’t, and it points to the crux of the problem. There is so much money in our system looking for a safe place to go that even a city that looks, on paper, to be a high risk investment is able to borrow at low rates. That, my friends, is what a bubble looks like. In the case of municipal bonds – and bonds in general – the mother of all bubbles. And if cities just seem absolutely clueless about basic economic principles, it is because they are. They live in a fantasy world divorced from the kind of decisions that normal corporations – cities are, in most of the country, incorporated municipalities – have to address. Take this report from my hometown newspaper (skip to the notes at the bottom). Yes, my city, which has an annual budget of over $9 million and gets over $3 million in direct aid from the state each year, can’t come up with $10,000 to design a roof for their water tower and so they are asking the state for help. Not only that, but they are willing to spend up to 20% of that cost just to make the ask. The time of a city employee making $85,000 per year would pencil out to be, after costs, around $115 per hour. If the city spends 20 hours coordinating with the consultant, making a second application to the state and writing reports on it to the council, then we’ve spent $4,300 in time and cash for the chance to get a $10,000 grant for something we have to do anyway. Financially, that is sheer lunacy. Voted to hire Preservation Design Works for about $1,200, but not to exceed $2,000, to write a grant application, among other things, to fund designing a roof on the historic water tower. City staff in June submitted an application to the state for $10,000 to fund designing a roof on the water tower, in order to prevent further water damage. But the application was denied. The state said it was a worthy project but the application was incomplete, said city planner Mark Ostgarden, noting that the application requires specific expertise in historical structures. It was really refreshing to see a conservative out of the UK speaking common sense on the way we finance auto transportation and what the implications for our lives are. This one was enjoyable. In general, most of us are pretty happy with letting the markets allocate scarce (in the economic sense) goods by deciding the price for them. We’re broadly happy with how this mechanism works for goods that nobody needs (like caviar) and goods that most people need (like chicken). We know that price controls, in general do not work well and capitalism, by and large, delivers the goods. With me so far? So what I want to know is this: why, the moment we get into our cars, do we all turn into screaming, pinko commies? Why do we reject the free market solutions that we embrace everywhere else? Why, rather than accept the idea that we should pay when we use a scarce resource (roads) do we ration them in the worst possible way. Why do we agree that, for a once-a-year fee, you can drive as much as you like, wherever you like and whenever you like? Atlantic City is imploding with the closing of a number of casinos – didn’t see that coming, not – and their general lack of economic diversity/relevance. I feel bad – a lot of good people are getting hurt – but it isn’t like this is a unique situation in any way, except perhaps by size. Unfortunately, their response to decline is classic third phase Ponzi scheme stuff. I’ll let our friend Craig Meek, author of the Memphis Que blog, describe it in his words (enlightened by his Memphis experience). I start reading this article and sarcastically think to myself, "Just put a Bass Pro Shop and a convention center in some of those big empty buildings." Read a few more paragraphs down and read that the mayor, "spoke optimistically last week of openings expected next year, including a Bass Pro Shops location and Harrah's Conference Center, that could create 1,300 jobs in the city." Our economy has reached the point of self-parody. An article in CityLab this week described how minimum parking requirements raise apartment costs and drive young families out of the city. I agree, although I would point out that, in all but a few places, apartments are generally not the answer either. We need continually maturing neighborhoods, incremental investments that might – at some point – grow to include apartments, but almost all of our built environment is a long ways from there. Get rid of parking minimums, for sure, and also get rid of rules that don’t allow the single family home to grow into a duplex, the duplex into a group of row houses and the row houses into a block with well-scaled apartment units. As the article points out, apartments are the “safe” way to accommodate people outside of the single family home . Segregate all those people into one box and then force them to have their own parking so it doesn’t impact me much. Communities don’t function well this way. So why do cities require developers to build parking and bundle it with apartments? Because people in surrounding neighborhoods don't want the residents of new apartments using up "their" street-parking spots. It's as if we were trying to get people to eat healthy affordable meals then forcing them to bundle it with an order of French fries because we don't want to upset the potato lobby. An interchange of two highways in Atlanta is projected to cost more than a billion dollars. A BILLION DOLLARS. Is there nothing better Atlanta can think to do with a billion dollars and then an interchange? Is that really the highest and best use – the highest returning investment – for that money? This is the kind of thinking that affluence has created – the notion that we don’t have to use our minds but can just throw money at a problem – and it is the kind of thinking we need to overcome if we are to end this decline. 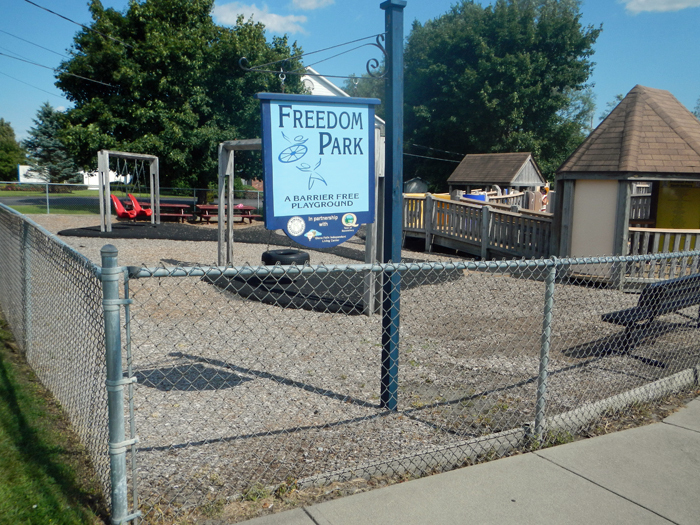 Kunstler’s eyesore of the month is the Freedom Park in Lake George Village, NY. The name Freedom Park is rather ironic, although perhaps it wouldn’t be to the Puritan descendants who dreamt up this installation. And finally, the highlight of my week is this video taken by a frustrated commuter in Montreal. I must admit I’ve listened to it – no exaggeration – twenty times. It is so perfect. In his frustration he correctly diagnoses the problem (traffic congestion everywhere at nearly all hours), acknowledges what traffic engineers seem incapable of (there’s no way to fix it) and then, in climactic form, gets to the heart of the blame by calling out the theorists who came up with this ridiculous approach. WHO MADE THIS CITY? Warning: some curse words not suitable for work. Also, as you hear this, don’t hear road rage – he isn’t yelling at his fellow motorists – but hear what I’m hearing: an awakening to reality born out of frustration. We need more of this. WHO MADE THIS CITY? We should all be asking ourselves that. Enjoy your weekend everyone. See you back here Monday morning.